If you are planning to buy a plot of land in south Chennai and its peripheries, then exercise maximum caution before investing in the property as it could be a plot usurped through fraudulent documents. 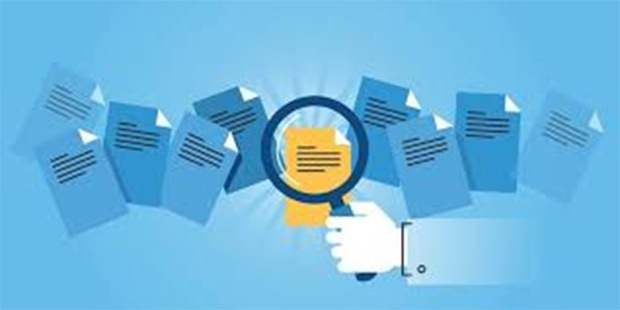 In the past four months, 17 cases of land registrations through double documentation worth of Rs 200 crore have been unearthed in the sub-registrar offices located in the southern parts of the city. 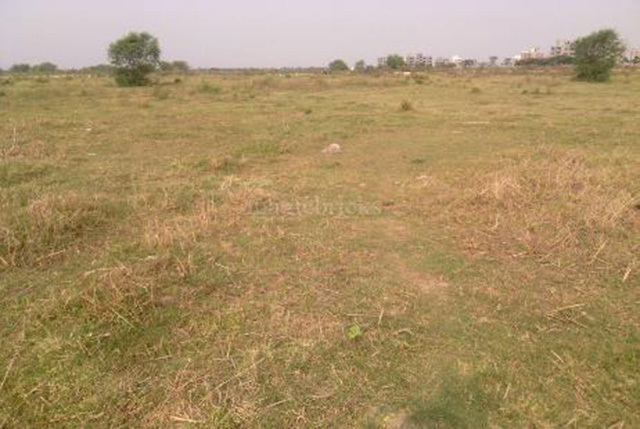 Land sharks have been eyeing no man’s land, vacant plots including the government’s poramboke to make a fortune in the realty market. All cases have been reported in the sub-registrar offices under the purview of the South Chennai District Registrar. The cases have come to the light, incidentally, after the arrest of a registration official P Sivapriya attached to South Chennai District Registrar who has been accused of aiding illegal property registrations in and around the Pallikaranaimarsh land. Registration department sources told TOI that illegal registrations came to light during a verification of a property transaction. According to official sources, every stamp paper has a different identity serial number. “But in one of the sale deed, whose registration was traced to November 1975, the same serial number was present in all the stamp papers. This raised our suspicion,” an official said adding that further inspection of the sale deed revealed that the entire document was forged. This apart, complaints from the original owners also brought the murky activity to light. Sources said about 40% visitors to the South Chennai District Registrar’s office were victims of forgery and had come to file complaints. Officials said there was a pattern to the fudging of documents. “The registrations with fake documents pertain to unclaimed and open land, and poramboke land of the government. It needs strenuous efforts to differentiate between a forged sale deed and original document because the fraudsters have recreated rubber stamps matching the old style,” a registration department official, privy to developments, said. While 17 such illegal documentations have been unearthed, steps are being taken to file FIRs, sources added. “The total transactions would be worth of Rs 200 crores,” an official said. When contacted, a senior official with the office of inspector general of registration said they have received complaints in this regard. “Fraudulent property registrations are generally rampant in South Chennai,” the official said. Did you know that your owner can’t evict a tenant if the tenant pays rent regularly, unless the owner wants to shift in? Well, we asked seven tenants and most were pretty clueless about the same. 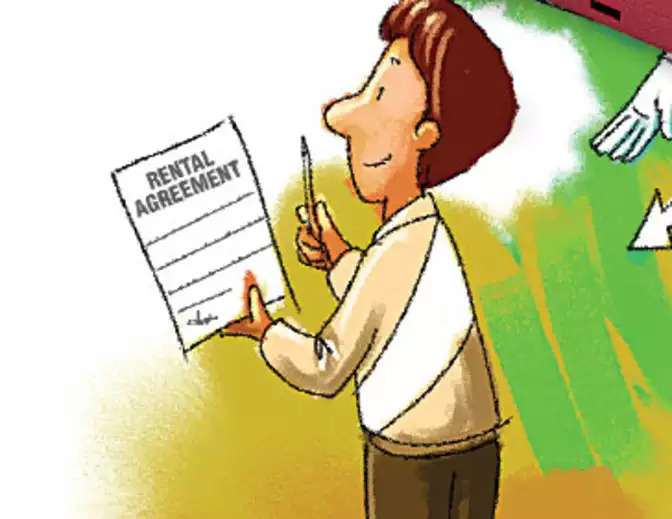 Here, we take you through the lesser known aspects of renting, thus busting myths that most tenants are subjected to. We’ve all heard dreaded stories of crazy landlords, hidden charges and dodgy properties that come along with a tenancy agreement. And now that many young adults are moving out of home, many Millennials are still in the early stages of their life and career, and are usually living in rented homes as they are keen to have flexibility in their career. The growing pressure to step onto the property ladder often leaves one unsure of the facts when it comes to renting and the options available. 4. Landlord is required to undertake all repairs – The terms of the lease agreement between the landlord and tenant need to be examined to understand the inter se obligations of the parties with respect to repairs and maintenance. In the absence of any agreement, the law requires the landlord to undertake repairs of structural nature only and the tenant is required to undertake day-to-day repairs and replacements. Inordinate delay by Chennai Corporation in processing and disposing of applications for regularisation of unapproved layouts has been frustrating applicants, who have to make several trips to Ripon Building to follow up on their papers. The civic body has received 5,297 applications for regularization since the scheme was rolled out on May 4, 2017, with most of the applications coming from Madhavaram, Ambattur, Valsaravakkam, Perungudi, and Shollinganallur zones. Since the extension of the May 3 deadline, the corporation received 1,891 applications. Calling for decentralisation of the process, which could be handled at zonal office levels involving more officials, residents say it is taking months now. “After I applied for approval of a plot in Puzhuthivakkam in November, not even an acknowledgment was sent. For every status update, I need to keep visiting Ripon Building. After all these months, I am yet to receive an approval,” said V Moses. Sources said only six engineers were working on the regularization files, though the number of pending applications ran to several thousands. Two plot owners were flummozed when they were asked to produce no-objection certificates from Airports Authority of India for layouts in Moulivakkam and Madhavaram. “What does AAI have to do with properties so far, in Moulivakkam?” questioned a resident. “We need a hassle-free and public-friendly approach. What is the use of conducting camps urging people to get their sub-divisions and layouts regularised, when the process is so cumbersome and never-ending?” questioned G Satish of Sholinganallur. Officials, however, told TOI that 240 layouts had been approved till date and that the process was picking up steam when compared to earlier months when only 13 layouts got approval in a span of a year. According to officials, 597 applications were for plots in CRZ area. “Non-submission of all the required documents by the applicant is one of the causes of delay. Once we get the update from CMDA, the applicant can submit all the missing files even in a day,” he said. Scrutiny of the framework plan takes two weeks for the CMDA if the documents are in order. Orders have been issued to involve two more engineers in regularization work, said an official. 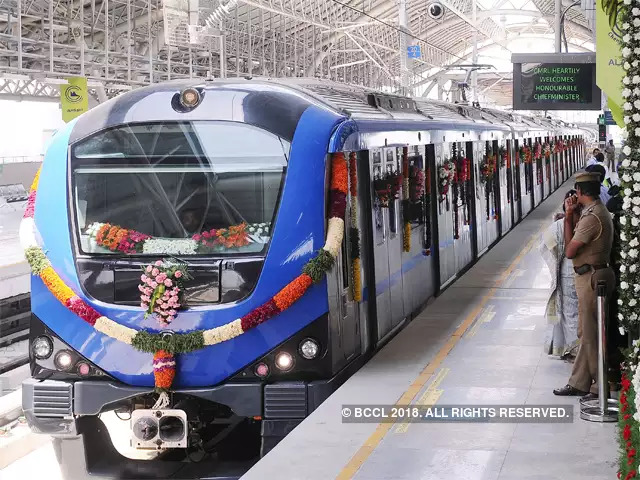 State Industries Minister M C Sampath told TOI that Central Metro, Egmore Metro, Shenoy Nagar and four other stations between AG-DMS and Little Mount on Anna Salai will be inaugurated on May 25. “The chief minister will be present. We have also invited the ministers of state,” said Sampath. On May 22, Sampath inspected the arrangements made in the stations including Egmore Metro, where the inaugural function will be held. Top Chennai Metro Rail Ltd (CMRL) officials were present during the inspection. When the 5.62-km line between Shenoy Nagar and Central Metro opens, commuters can board a train every five minutes to Shenoy Nagar, Anna Nagar, CMBT and St Thomas Mount. They will also be able to board a direct service to airport or reach Anna Salai by shifting corridors at Alandur metro. At Central, only the upper track level connecting stations on Poonamallee High Road will be opened. The lower track linking Anna Salai is not yet ready. The 4.5-km stretch between Little Mount and AG-DMS can take commuters arriving at the busy bus stops in DMS and Saidapet and from surrounding localities up to the airport. Passengers can shift corridors in Alandur station and proceed to CMBT or to Central Metro. Both the stretches were delayed by nearly two years, as their earlier deadline was December 2015. Work in the Anna Salai line was stalled for a year after a Russian contractor, who was building tunnels and stations between May Day Park and Saidapet, abandoned work citing financial crisis. This forced the government to open bids again and award contracts in small packages to firms to finish the pending work. Commissioner of metro rail safety KA Manoharan and his team last week conducted inspections of the stations and tunnels. He said authorisation would be given this week subject to certain conditions like completion of passenger amenities in the stations. “At Central Metro, they have only one entry point ready. They should have one more entrance ready for evacuation of passengers during emergency,” he said after the inspection. 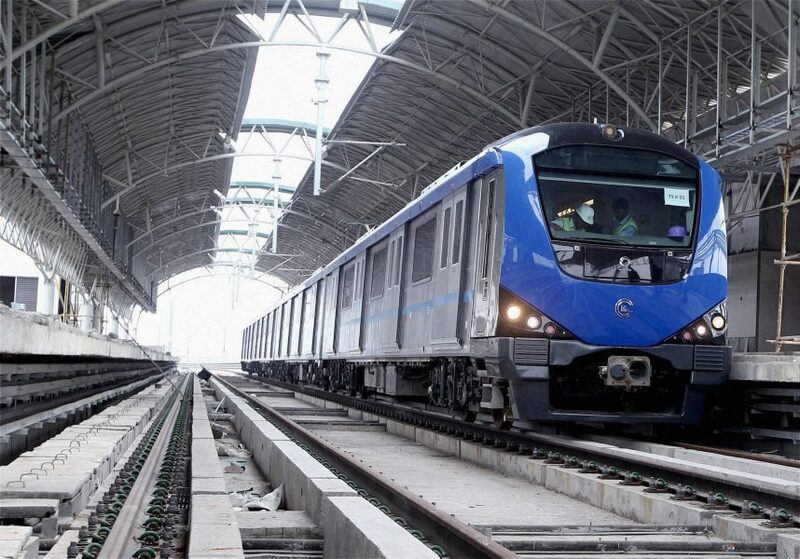 The Tamil Nadu government may be awaiting nod from the Centre for phase 2of Chennai metro rail (CMRL) project but the authorities have worked out how many commuters may use the three-corridors. CMRL has projected that in 25 years, the massive 107.55km phase-2 is expected to cater to more than 32.7 lakh commuters daily. The second phase of the project will connect northern suburbs of the city with the IT hub along Old Mahabalipuram Road and Porur via major locations like Mylapore, Adyar, Virugambakkam and Koyambedu. 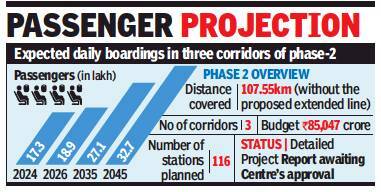 The lines will have 116 stations and is estimated to cost Rs 85,047 crore. Nearly 80 new trains are expected to run on this stretch. To arrive at the expected ridership by 2045, CMRL has estimated that around 23,600 commuters will have to board trains running in one direction in an hour in corridor 3 between Madhavaram and Siruseri SIPCOT. In corridor four between CMBT to Light House, a maximum 17,000 commuters will have to travel per hour, and more than 27,500 passengers will have to take a ride in corridor five between Madhavaram to Sholinganallur. Corridor four is likely to be extended up to Poonamallee to connect more areas. While CMRL is expecting to achieve these numbers more than two decades later when the entire phase-2 will be operational, they are estimating that more 15,000 commuters will be boarding trains in a single direction in an hour in corridor 3 by 2024. Metro Rail MD Pankaj Kumar Bansal had said earlier that corridor 3 which would be built first is expected to be completed in six years, once the construction begins. However, in the 45km phase-1, CMRL is yet to achieve its estimated ridership, though half of it is operational. They now have an average of 30,000 passengers daily, which is less than 10% of their projections. Recently, the Centre which was processing the detailed project report for phase-2 raised questions on the poor patronage. In its letter, the ministry of housing and urban Affairs said, “The projected ridership for 45km line was 7.76 lakh, but the actual ridership is just 30,000. It should have been close to 4.5 lakh” per day. CMRL blames the lack of patronage to the delay in the opening of major stretches in Central and Anna Salai.